Heat oven to 325°F. Grease and flour 12-cup fluted tube cake pan, or spray with baking spray with flour. In ungreased shallow pan, spread coconut. Bake uncovered 5 to 7 minutes, stirring occasionally, until golden brown. Reserve 2 tablespoons toasted coconut for garnish. Make cake batter as directed on box. Fold remaining toasted coconut into batter. Pour into pan. Bake as directed on box for fluted tube pan. Cool 15 minutes; remove from pan to cooling rack. Cool completely, about 1 hour. In small microwavable bowl, microwave frosting uncovered on Medium (50%) 15 seconds. Drizzle frosting over top of cake. Sprinkle with reserved toasted coconut. Cut cake with serrated knife. Store loosely covered. For best results, do not spray fluted tube cake pans with cooking spray. Use shortening and flour or baking spray with flour. 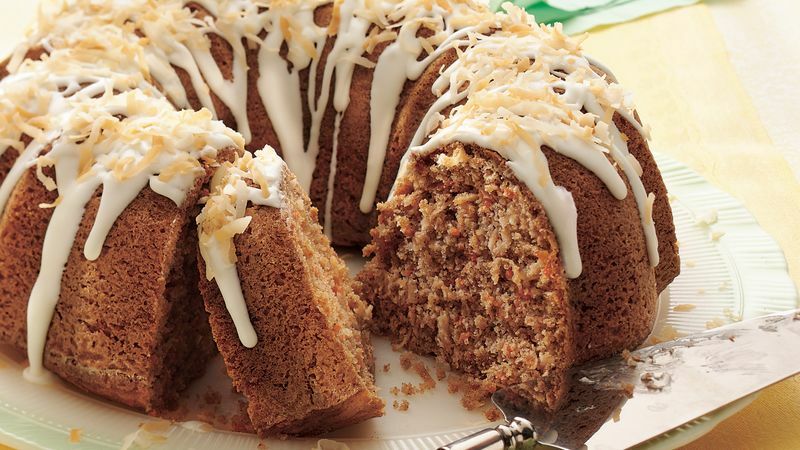 For extra coconut flavor, stir 1/2 teaspoon coconut extract into the frosting. If you’ve been looking for an excuse to use your bundt pan, this is it. This sweet and spicy coconut carrot cake is lovable for more than one reason. The recipe calls for just three ingredients — plus the standard egg, oil and water — feeds 16 people and only takes 20 minutes to prep. So grab your coconut, Betty Crocker™ Super Moist™ carrot cake mix and Rich & Creamy vanilla frosting — tonight, there will be dessert! Don’t forget Betty knows her cake and there are plenty more carrot cake recipes where this one came from, plus all the tips and tricks you need to make perfect cake every time.